Wanting to learn how to take a self portrait may seem a little strange at first. After all, usually you are the creator of the photograph, the artist and not the subject. When taking a picture of self, you are both the photographer, the subject and probably the main viewer of your own portrait as well. You might think that this is obsolete information. Cell phones and tablet computers have front facing cameras. 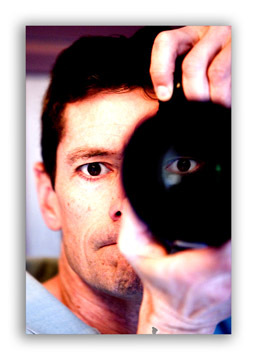 Point and shoot cameras and DSLRs have rotating LCD screens , but there is a difference between a quick "selfie" and a planned out self-portrait. This article will give you some tips for the photo equipment to use, as well as some ideas on the creative side of creating a great self portrait. Here are some really creative ideas for selfies. Using a tripod makes it easier for you to compose your photo ahead of time and insure that the camera will be aimed in the right direction. 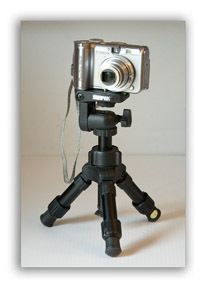 I usually have this mini tripod made by Sunpak with me. It's so light, it's compact and is perfect for a point and shoot digital camera for using on a table top or if I am shoot something down low. It has all of the features of a full size tripod. It can tilt, swing or rotate, but it won't be stable enough for a full sized digital slr. UPDATE: The emergence of the selfie monopod as an extremely popular cell phone accessory, quite affordable and selling like crazy on Amazon, has changed the way people are taking their own portraits. Another very versatile piece of photography equipment is a camera clamp. It can clamp on anything that is sturdy and it's arm can be bent in any direction. When I have been caught without a tripod, I've used a bean bag, a towel or a pillow. As long as your camera can be supported and aimed without the chance of falling, you can use your ingenuity if you don't have a tripod. 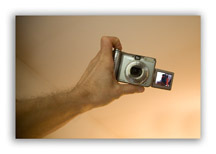 If you have a camera with a rotating LCD screen like my Canon Powershot A620, you can hold it at arms length and still see the screen to compose your self portrait. I call this the Facebook method. If you are not able to see the LCD and you are holding the camera as you shoot, set it to wide angle and at least you know you'll be in the photo. Optional equipment I once read about a technique of placing a mirror behind the camera, so that I could see myself as I took my self portrait. The whole set up of hanging the mirror and getting the angle right and was difficult. Another piece of equipment to use when you want to learn how to take a self portrait is a remote shutter release. It allows you to take your own picture when you are not near the camera. This self portrait was easy to compose because I wanted to make a picture of self as a photographer. I stood in front of the mirror, aimed, then zoomed in to get a tight crop. It was a bright day and there was enough existing light with my Canon 5D set at ISO 1600 to shoot in our bathroom without flash. I did a little creative retouching with Adobe Photoshop and created the eye within the camera lens, and then added saturation and contrast to give it an "edgy" look. Once you know how to take a self portrait that is straight forward, you may want to consider getting a little creative. If you want some ideas, I suggest you go to Flickr. When I last looked, there were over 300,000 pictures in the "self portrait" category and over 17,000 members in the group 365 Days. This groups is a group of photographers who have given themselves the assignment of taking a self portrait, everyday for an entire year. Not only is that challenging, but it will surely get your creative juices flowing. There are some average photos and some not so great photos: but there is so much variety and creativity, it's bound to inspire you to think outside the box. Taking a picture of self can be a step outside your comfort zone. 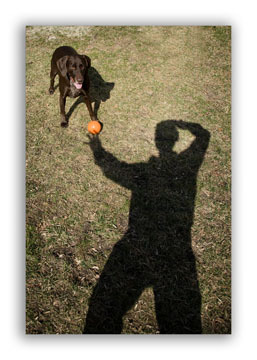 In this shadow self portrait, I used the Rule of Thirds and the principle of balance to compose this photo. When I got my first film camera, I didn't how to take a self portrait. The camera had no self timer or cable to trigger the camera's shutter. Now, timers are standard on all digital camera's and the fact that you can experiment and delete your Photo Mistakes. It's a lot easier to get creative when you take a self portrait, because you can see your results right away with your digital camera. The other benefit of learning how to take a self portrait is that you are learning how to take better pictures in general. Simply because of the wide variety of techniques you are using to create yours self portrait, you are getting to be a better photographer. A whimsical look at the meaning of the selfie portrait.